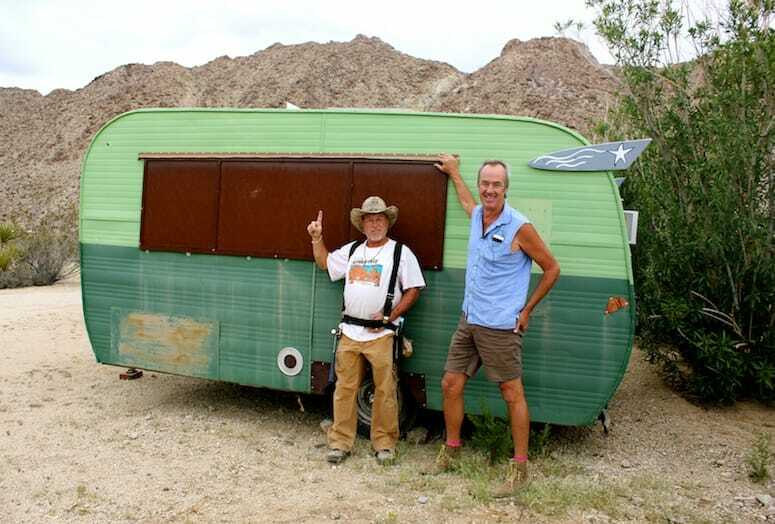 Barnett English and his friend, Steve Scigilano, proudly show off their 72 hour trailer renovation done with all recycled material. The Green Tortoise Trailer was the first trailer Barnett purchased from a friend for $50. VIDEO: See the stable of trailers for rent and hear from Joshua Tree Music Festival founder Barnett English. Barnett English has had a love affair with music since he was 10 years old. He’s obsessed with finding music. He’s been to more than 600 music festivals on the west coast alone. His biggest thrill is blowing people’s mind with music they wouldn’t normally hear. That’s exactly why 23 years ago he thought it would be a great idea to start a music festival in Joshua Tree. Six years ago he started adding trailers to rent at the festival. His thoughts: rent a trailer, stay longer, have more real and meaningful interactions that would deepen your overall festival community experience. His first vintage trailer (the green tortoise) came at a cost of $50, he unloaded it from a friend, another good buddy helped with the renovations, and in less than 72 hours came a cozy goodness on wheels. His first $50 trailer renovation has now turned into what Barnett likes to call “ A hobby gone wild,” with more than 24 trailers on site and more in the works. According to Barnett, it’s hard to turn them away, they are so readily available, affordable, and they all come with a great story. Joshua Tree Music Festival, Oct. 8-11, Joshua Tree Lake Campground, 2601 Sunfair Road; www.joshuatreemusicfestival.com (look for trailer rentals under Event Info). The plans for the interior of the Quincy Trailer will include new walls, two queen size beds, a long couch, two sinks and new flooring. Barnett English plans to transform this large-sized trailer into a cozy family size sleeper. The Oasis Trailer is a perfect example of how a vintage trailer can be restored to its original mobile glory with new sink cabinets, cozy colored cushioned seating, and “paper-bagged” flooring. As Barnett English puts it, “This trailer came in looking like a dog!” Now he refers to it as his most artistic creation — his Flower Power Production Trailer. Using electric metal shears and a ton of metal junk, he transformed this dog into a flower power mobile masterpiece. The Coop Da Ville started off as a basic pop-up tent trailer. Barnett English and his team added an old metal shed that was recycled, and old windows from an old trailer that was destroyed. It sleeps one or a small couple, and it’s super light and can be easily towed. Barnett English, Joshua Tree Music Festival's creator/director, holds up his mobile coffee sign, Javagogo. He’s been selling coffee at festivals since 1993. That's how he originally came up with the idea to start a music festival in Joshua Tree back in 2002.